How many awful presentations have you attended? How many have you given? Awful presentations are too often the norm, with swathes of text on the screen, presenters speaking over everyone’s heads, little interaction, no stories, poor images and a bored audience. Why? 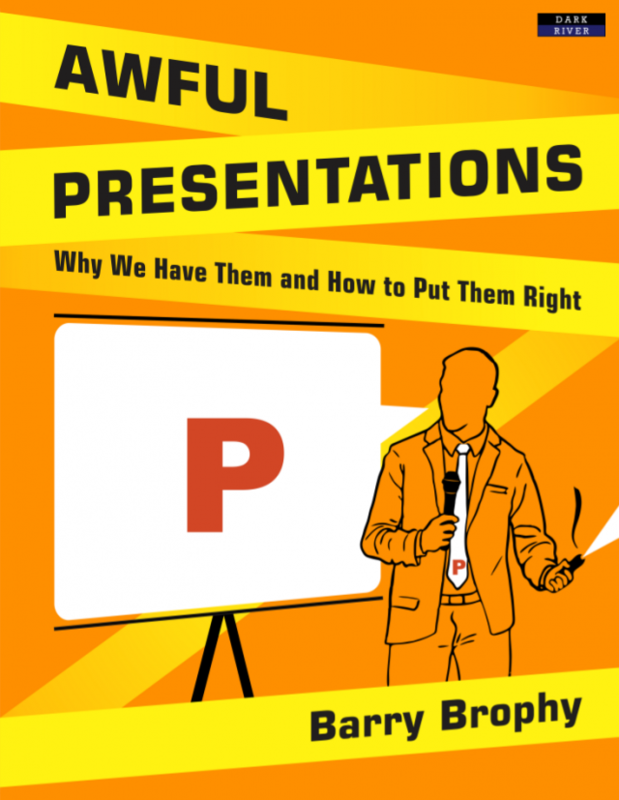 In this book, presentation specialist Barry Brophy explains why competent people give hapless presentations. And it’s not because of nerves. Most of what you thought you knew about presentations is wrong; successful presentations are not about speaking but listening. They are not about your knowledge but the audience’s needs. They are not about ditching PowerPoint but using it properly. They are not about overcoming fear when speaking but overcoming caution when preparing. The truth is you already have the skills to present – your conversational skills – and anyone can craft a spellbinding presentation. Conversations work whereas presentations invariably fail, and this book explains the hidden mental habits which can lead you to misuse your already-perfected speaking skills when presenting. > Make your presentations zing. A presentation is not facts, it’s an interpretation of facts. Your job as a presenter is to advise and guide your audience. > Communicate knowledge to an audience at any level. A presentation fits into a wider communication chain. Understanding this will help you to figure out what works in a presentation – stories, images, videos, examples, analogies, demonstrations, interaction – and, crucially, what should be left out. > Make your presentation audience-centred not presenter-centred. Don’t define your presentation based what you know but rather on what the audience needs to hear. > Connect with your audience. Content is the dominant factor in a presentation, not delivery. You already know how to deliver; you do it every time you open your mouth. The key is to tap into this conversational energy and fluency. > Embrace PowerPoint to make your presentations first class. Barry Brophy has nearly two decades of experience helping people make presentations in both the private sector and as a lecturer at University College Dublin. There he has developed specialist Masters Courses that run across all disciplines and has carried out research on how oral presentations work. He is also the author of The Natural Presenter – Turning Conversations into Presentations, which was published in 2007. Book Categories: Barry Brophy, Business and Self-Help.